Lagom is a uniquely Swedish term that doesn’t have an English equivalent (Which I find to be pretty common, the Swedish language has denser words that the English language usually uses two or three words to describe.) Not only does it not translate perfectly but its just a very Swedish idea, or feeling. A popular etymological translation is “around the team” meaning enough food or drink for everyone at the table, this translation is said to go back to Viking times. Lagom is “Just enough,” “Not too much or too little,” “Just right,” “Enough to go around,” “Fair share.” It indicates balance. Lagom doesn’t have the negative connotation of “sufficient” nor does it claim perfection. It works in a lot of different contexts, which is why its so interesting and special. When searching for unique words, this one was always proudly suggested. “How are you?” can be answered with lagom. “How is the weather?” “Lagom” Someone can be a “lagom” height. This term not only has many applications but it represents the Swedish cultural and social ideals of equality and fairness. Love, Life, and Lagom is exactly why I’m here! Hope that helps! Wow, I’m going to use this word……..I think it’s what we all search for “perfect balance”. This is my “find” of the week. I agree with grand-player. “English” is dotted with a lot of words from other languages that we have adopted for everyday use – English should adopt lagom – all in favour? You can also translate Lagom to Just Right (not too much and not too little). I just found some super fun videos on http://www.nordstjernan.com/trueswedish about a Swedish American Guy exploring Swedish places and people in New York. He is also talking about Lagom. There’s only one word to describe this fascinating post: Lagom! I love the concept of lagom. If more people lived with this in mind, there may be more contentment and acceptance that we only need so much of everything in life. I’m American and I know this sounds stupid… but it really bothers me that I’ll never know the true definition of what “lagom” means. Lagom can also restrict freedom of choice, what happens when you want less than lagom or God forbid more than lagom? Lagom dressed, lagom car, lagom cake. It can easily turn grey, boring, predestinating using the word lagom. It’s like reducing everything to numbers and procentage taking away individualism. It means, less carbon footprint, plenty to go around, no need to have more. How much more individualism do you need? You are already you! The seducing power of materialism, competitivism, and general feeling on not being enough is a dis-ease. 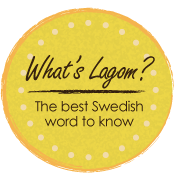 How do you pronounce LAGOM? Those uniquely Swedish bachelor farmer phrases like, “I don’t want you to think I’m not happy about it.” or “A guy could do worse.” Probably translate from this word.